Orient Express Yourself, was a participatory performance functioning as a restaurant with it’s own absurd economy. The fully equipped kitchen, with trained restaurant workers, sold the audience (the “customers”) falafel in exchange for a statement in their own words. The customers paid prices ranging from 15 to 299 words, and answered questions relating to memories of family and gender roles, as well as the effects of destructive patriarchal structures. 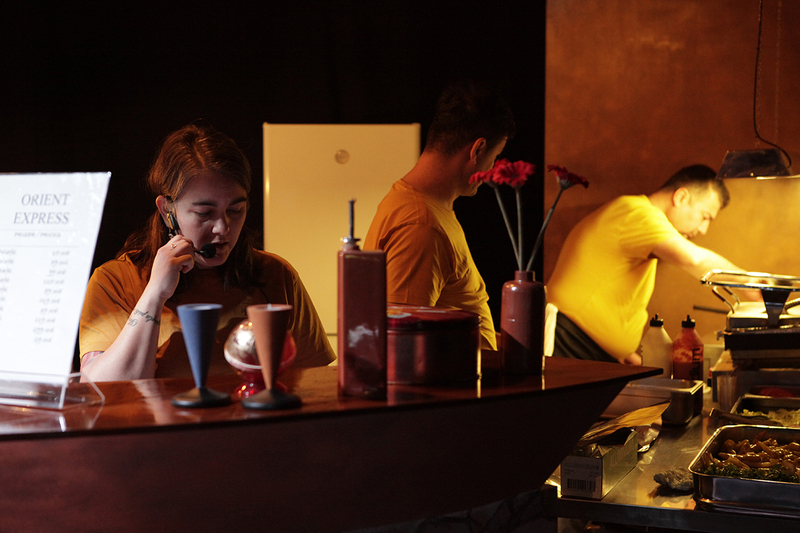 At the counter, the customers deposited their answers into a waiting microphone, standing with their back to the audience, allowing for the feeling of a one-on-one encounter with the saleswoman, while in fact, both the questions and the customer’s replies were broadcast into the space through loudspeakers throughout the gallery. This amplification created a window into the inner world of each participant, while transforming their self-representation into a commodity. Additionally, several “special offers” could be heard during the night over the loudspeakers, where the possibility to elaborate on popular feminist quotes would form another method of payment and come with “a free juice or cola”. The hijacking of commercial language and the interweaving of it with feminist discourse allowed for humorous eruptions that simultaneously highlighted the automatic subsumption of anything and everything into the capitalist frame. Orient Express Yourself addresses the way identity, and personal history, quite literally constitute economies of their own as seen in contemporary life, where personal image-management and the sharing and commodifying of one’s private sphere is increasingly on demand and normalized. 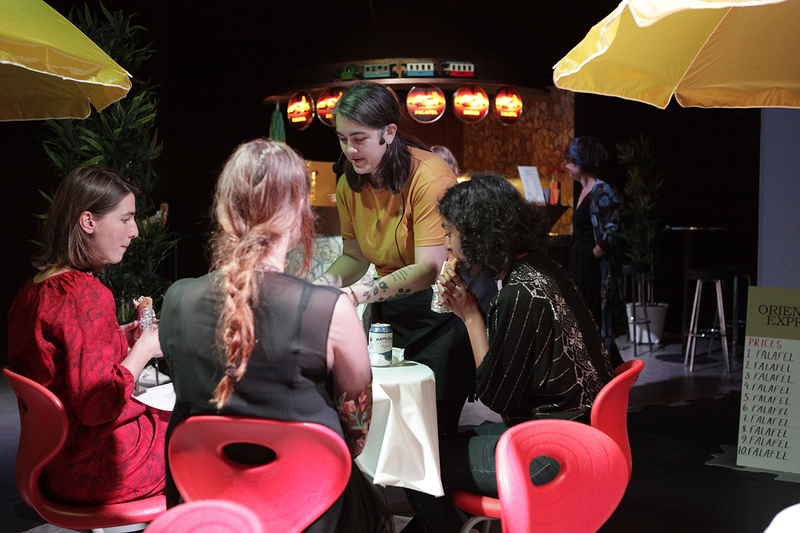 On the other hand, the playful exchange between the restaurant staff and audience recouped the everyday capitalist system (the restaurant) for a few days, allowing viewers to imagine an alternative economy, where words are capital, emotions are at centre stage, and sharing can give way for catharsis and a sense of belonging. Orient Express Yourself was first implemented at Lilith Performance studio for 5 hours a day, for 3 days, in 2017. 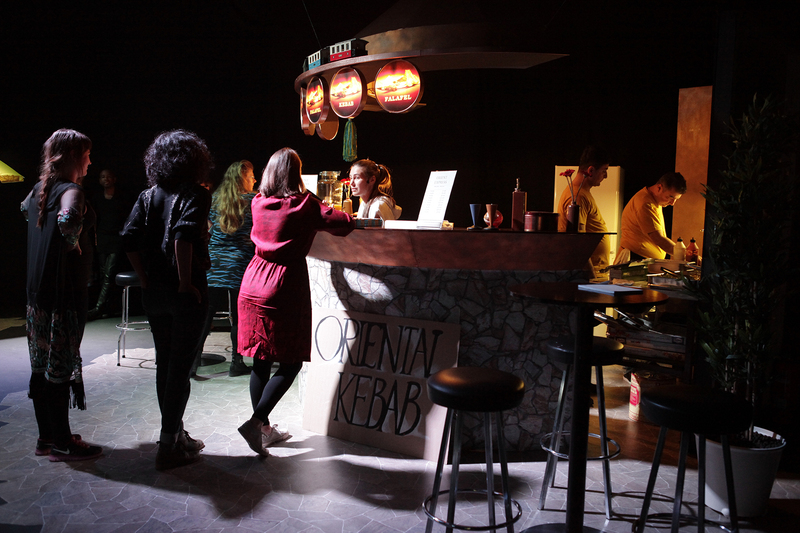 An additional version of the performance was later repeated at Gallery Wedding as Falafel Interval where for the occasion of the opening, two women sold falafels from trays while walking around the space and collecting people’s payments into an audio recorder. 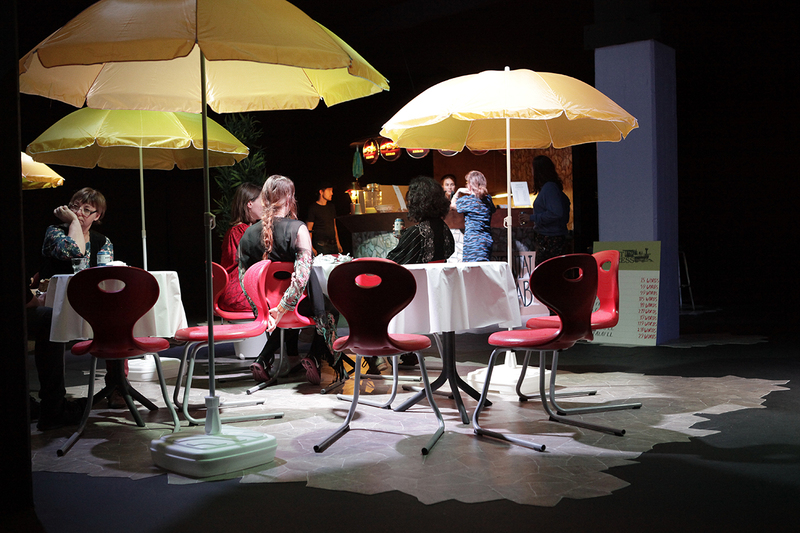 A third version, Siblings was shown at SIC Space Helsinki where the artist’s siblings (and actors of the original commercial video from 1986) made and sold the falafel in exchange for words in the functioning restaurant during the opening.